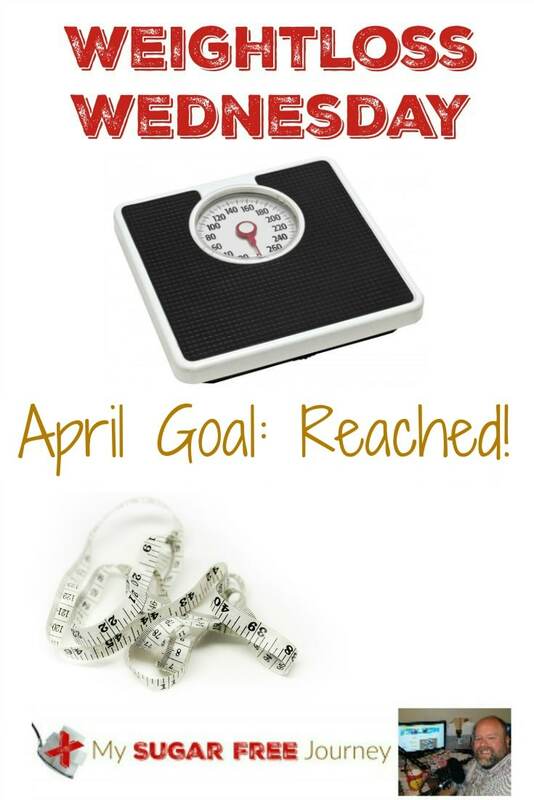 4/27 Weightloss Wednesday: April Goals Reached! 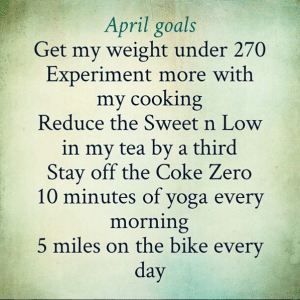 So way back in the beginning of April, I set a few goals. This is the last Weightloss Wednesday of the month so lets check in on those. The most important one is that goal weight and I am happy to report that as of this morning I’m 270.1 lbs so I’m rounding down to 270. I’ve got a few days left to lose that last tenth of a pound so I know it won’t be a problem. Of everything that I’ve managed to accomplish this month, that 270 on the scale is what I’m most proud of and seeing my weight go down a little each day gets me so freaking excited I can’t hardly contain myself. Next I decided I wanted to experiment more with my cooking and that is going awesome. The recipe I’m most proud of is my Cauliflower Tots because it took me so many tries to get it right but once I did, it was worth it! 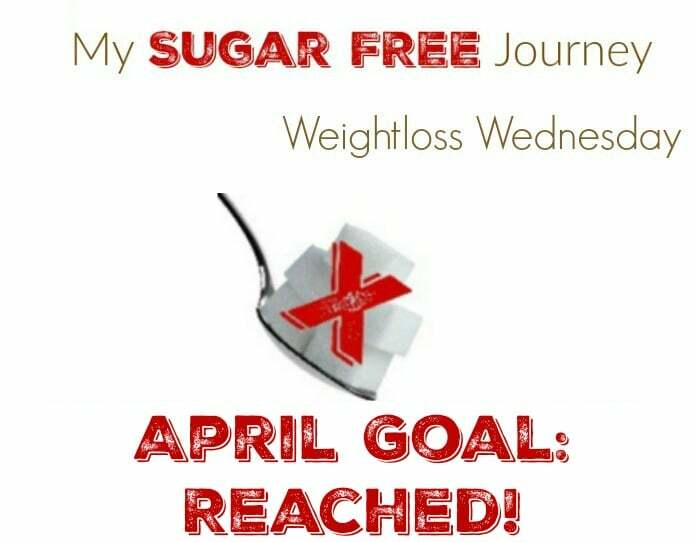 You can check out all my Sugar Free Recipes here. Then I wanted to reduce the Sweet n Low in my evening tea by a third. I wanted to do this because I really want to totally break myself from the “tyranny of the sweet” where I don’t feel a meal is complete without something sweet in it. Plus, removing sweeteners has enabled my tongue to taste the natural sweetness in other foods. 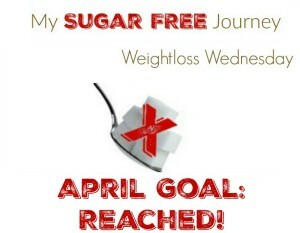 I’m continually amazed at how sweet foods are now that I don’t eat sugar. 2 nights ago I went with my son to the Rangers game and really struggled internally with what I was going to drink. I knew I didn’t want a beer but I also knew that the only other real option was a Coke Zero. I managed to stay strong while my son tore through a BBQ sandwich, a chili dog, and 2 beers. I got home and had a nice glass of tea to celebrate. The yoga I’ve been VERY inconsistent with and it’s the one thing I’ve really failed with. I started off strong and then just stopped. Not sure why but I think I’m just not a morning person. Maybe I should move this to the last thing I do each day instead of the first. The 5 miles on the bike is a different story. Not only has this been easy to do but I really enjoy it. I find myself working harder during the day to get everything done just so I have enough time to get those 5 miles in before I cook dinner. So all in all, goals are good and it feels great when you meet them. If you would like to see my May goals, be sure to follow me on Instagram because that’s where I will be posting them as soon as I figure out what they will be. Enjoy this week’s video and be sure to subscribe to my daily email to never miss a post or the YouTube channel to never miss a video! PREVIOUS POST Previous post: Low Carb Cauliflower Tots Recipe!